Taiko at the Tidal Basin! Join us for our biggest annual event! 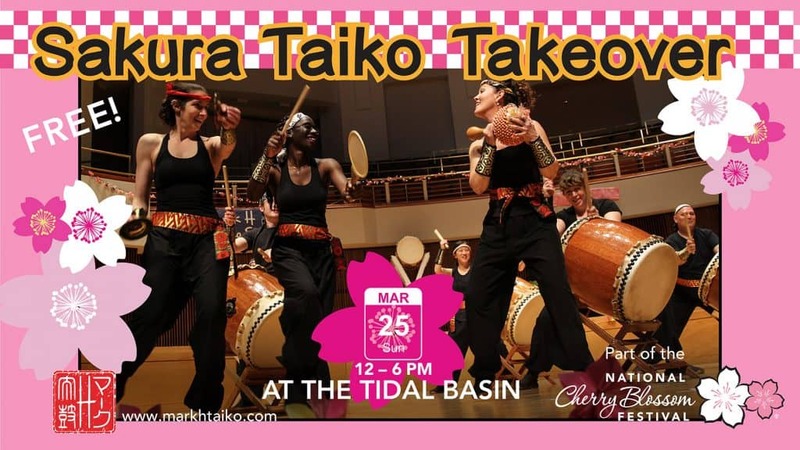 On Sunday, March 31st, we are taking over the ANA Performance stage at the Tidal Basin for 6 hours of FREE, fun, family-friendly taiko performances! There will be groups from Michigan, Pennsylvania, New York, North Carolina, Massachusetts, and of course local favorites from right here in the DC area! 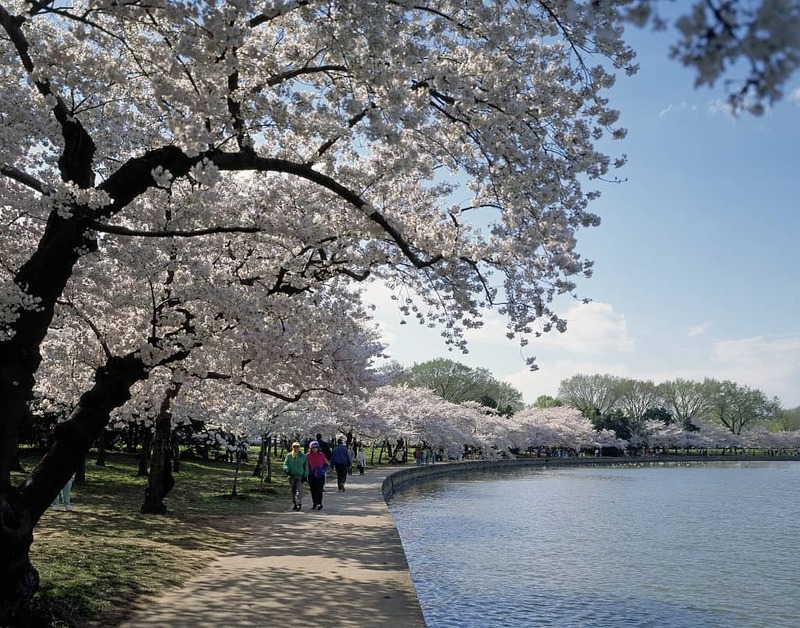 Peak bloom for DC’s famous cherry blossoms is projected to be just a couple of days afterwards, so it should be a great day to visit the Tidal Basin! We’ve got all the details for you! Check out the day’s full schedule, find out how to get to the Tidal Basin (hint: beat the traffic and take Metro), and more! Support our performers and help make the Sakura Taiko Takeover possible! 100% of proceeds will go to covering the costs of the event and supporting the taiko groups traveling to the DC area. See you at the Tidal Basin! 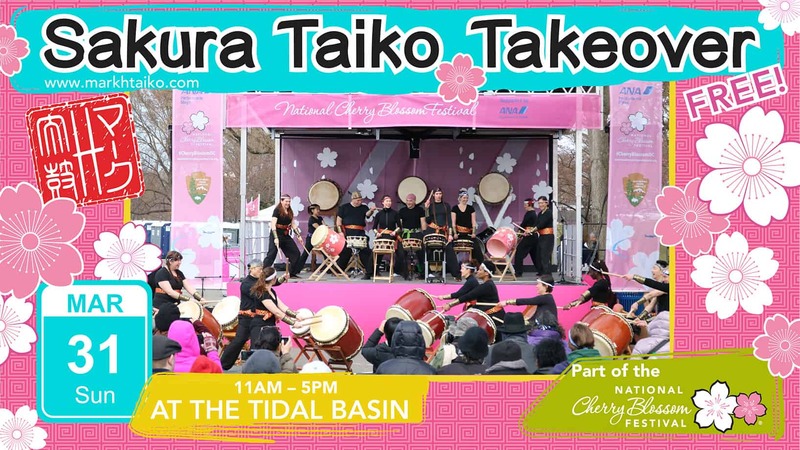 See you this Sunday at the Tidal Basin for our Sakura Taiko Takeover! 1:15 – Mark H Taiko Recreational Class & Try Taiko Yourself! Did you get some cool pix or video of the performances? We’d love to see them! #taikotakeover on Instagram or Twitter or post them in our Facebook event! Do you want to learn to play taiko? Our next Introductory Taiko Workshop is on Sunday, April 22 in Takoma Park! Join us! Our Sakura Taiko Takeover is happening in less than two weeks … and it looks like our event will line up almost exactly with peak bloom! What a wonderful way to kick off spring! The full schedule for the day is now available – check it out on our official event page! Stay up to date via our Facebook event! See you on Sunday, March 25!